This 2018 BMW M3 is the one to own. Meticulously well kept and maintained by its one owner. BMW enthusiast owned and tastefully modified. Stage II Active Autowerk Tune, Exhaust & Down-pipe really adds to the already outstanding driving experience. The original owner of this car was out the door at well over $90,000 new. Just received its 10k mile service by the local BMW dealership and is ready for its new garage! 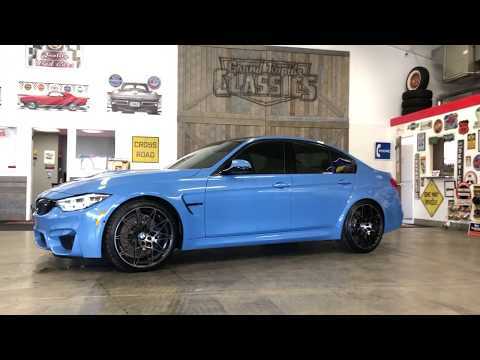 Highly desirable color combination of Marina Blue over Black leather interior, Full Carbon Fiber Roof, ZCP-Competition PKG, and all the driver assist and technology gadgets. Feel free to call or TXt with specific questions. (616)401-5555. ASSISTANCE WITH FINANCING AND WORLDWIDE SHIPPING IS AVAILABLE ON ALL OF OUR VEHICLES!! !